In the Pages app, which is the word-processing and page-layout tool in the iWork suite of apps for the iPad, the Format button on the toolbar to the top-right of the document opens a popover that provides settings in addition to those shown on the ruler. When you select text and tap the Format button, you see a popover with three tabs along the top: Style, List, and Layout. Select a tab to access various formatting options. The powerful Style popover has a wide range of functionality. The topmost section lets you set the character style for the selected text. The character style is simply the style applied to characters. The second section of the popover lets you set the paragraph style — the style for the entire paragraph in which the selection is set. 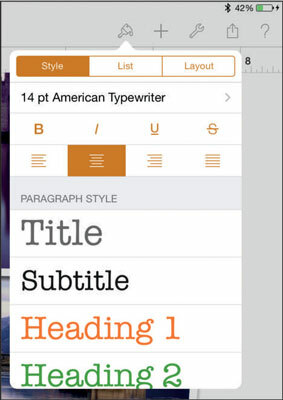 After selecting the characters you want to style, tap Format and then the current font setting in the popover. (It’s 14-point American Typewriter in the first figure.) 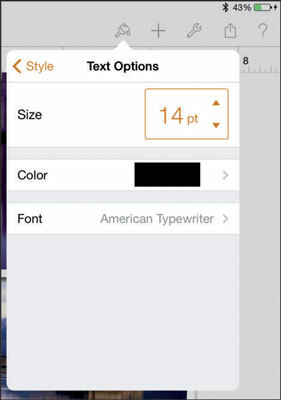 The popover shown in this figure opens, and you can select another font, font size, or color for the font. 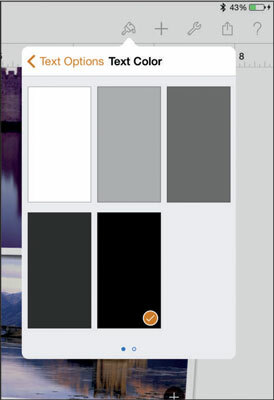 Tap the color well (the swatch of color next to the word Color), and you can select a new color, as shown in this figure. After you select a paragraph, tap the Format button and then, in the popover, tap the List tab to experiment with indentation and lists. The options shown in this figure include arrow buttons at the top of the view that let you move the left margin in (indent) or out (outdent). 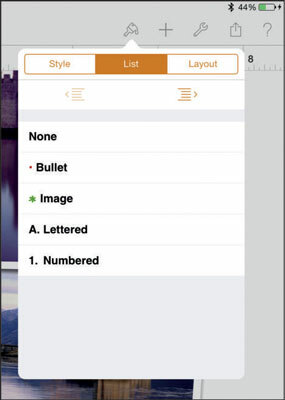 You also can choose to make automatic numbering, lettering, or bullets available by choosing a list format. When you add an element to the list or delete an element from it, Pages automatically renumbers the list for you. The Layout tab in the top-right corner of the Format popover lets you set layout options, as shown in this figure. 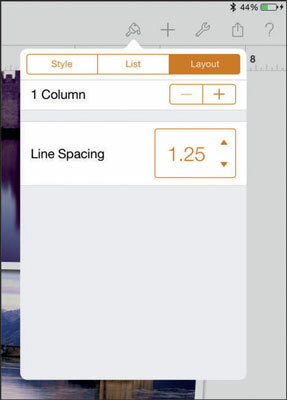 These include the options for creating columns and adjusting line spacing.